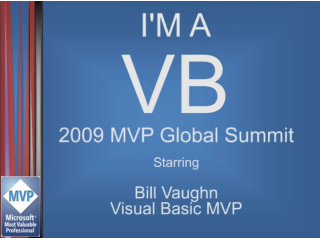 Jim Duffy, Visual Basic MVP, is one of the funniest people I know. At the MVP summit I grabbed him for a quick interview on how he uses Visual Basic and his favorite features, but what I didn't realize is how many smart a$$ answers I would get from him. I got him back though -- just take a look at the sub-titles Jim's a great sport and there are some definite gems in here. Check out Jim's MVP bio.